Rising temperatures may lead to a “feminisation” of the species. The gender of turtle hatchlings is determined by temperature, and at present about 52% of hatching green turtles – one of seven species of sea turtle – are female. However, a study by the University of Exeter in England and the Marine and Environmental Sciences Centre in Portugal shows that in warmer temperatures predicted by Intergovernmental Panel on Climate Change (IPCC) scenarios, 76-93% of hatchlings would be female. 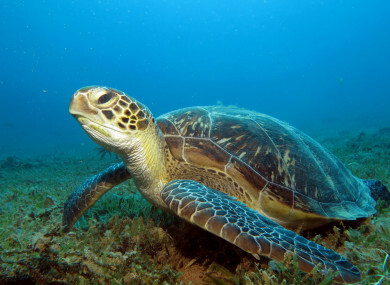 “Green turtles are facing trouble in the future due to loss of habitats and increasing temperatures,” Dr Rita Patricio, of the Centre for Ecology and Conservation on the University of Exeter’s Penryn Campus in Cornwall, said. “Our results suggest the nesting population of green turtles on the Bijagós Archipelago, Guinea-Bissau, will cope with the effects of climate change until 2100. Cooler temperatures, both at the end of the nesting season and in shaded areas, will guarantee some hatchlings are male. “Beach retreat may be OK in some areas, but the turtles we studied were nesting on a small island (Poilão Island) so there is a limit to how far the beach can go,” Patricio said. Email “Up to 93% of green turtles could be female by 2100 due to climate change ”. Feedback on “Up to 93% of green turtles could be female by 2100 due to climate change ”.